It has long been recommended that you arrive at the airport at least two hours ahead of your flight time if you're flying domestic, and a whopping three hours if you're flying international. Why is that? Mainly it's because of the long lines at airport security. How many people have missed their flight because of waiting in an impossibly long line? Who knows? But there's a solution to that problem, and it's called TSA Precheck. If you are a US Citizen in good standing (most felony convictions or indictments will disqualify you) you can apply for the Transportation Security Administration's expedited security screening program or TSA PreCheck. What Does TSA Precheck Do For You? 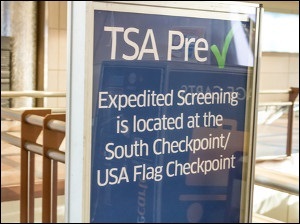 TSA Precheck provides participants with expedited security screening. No more removing your shoes, taking off you belt, digging your laptop out of its bag, and worrying about the amount of liquid (such as lotions, cosmetics, mouthwash and the like) you have in your carry on luggage. Also, you get to take advantage special TSA Precheck line that is much shorter than the typical screening line , which is a major plus. TSA Precheck is open to any U.S. citizen, U.S. national or lawful permanent resident that has not been convicted of any of the disqualifying criminal offenses. As you can see the list of participating airports and airlines is extensive, so if you're an American Citizen flying domestically or your departing from a domestic airport to a foreign location, it's very likely your local airport and favorite carrier offers TSA Precheck. There are two ways you can sign up for TSA Precheck. You can fill out an online application or go to an Application Center. If you have an unexpired US Passport book or card, that's all you'll need to process your application. If you don't have an unexpired US Passport, take at look at the TSA Precheck document requirements to see what other documentation you can use. Flying is a hassle. There are delays, canceled flights, cramped seats, and long, seemingly endless lines, but you can make traveling a little less of a hassle by signing up for TSA Precheck. It's simple, inexpensive (only $85 at the time of this writing), and well worth it if you're a frequent flyer.